An anniversary year is always special. And that’s how it was for Help without Frontiers. The year started with a shock for us. Thomas Öggl, one of our volunteers from Schlanders, Italy, had serious complications after having his appendix removed and went through a long and painful period of recovery. After doing a summer internship in our Brixen office, he is now studying in Vienna. In January Alessandra Degli Esposti started working in our Brixen office and from June she replaced Katya Waldboth, who left us unexpectedly. Our board member Anne Delle Mulle had to step down due to personal reasons and was replaced by Bibi Niederkofler. In autumn Christina Kuppelwieser also stepped down because of personal reasons. She was not replaced by anyone. We thank both board members for their active involvement and are happy to have them both with us as members. In April our President Benno Roeggla received 10.000 Euros and the ‘Preis der Menschlichkeit” (Prize for Humanity) from the Kiwanis Club in South Tyrol. In spring of last year the situation for the people in Burma improved noticeably. Our initial idea was to set up activity inside Burma/Myanmar, but in the end we decided against this. We saw how, with the opening up of Burma, many other organizations suddenly stopped all activities along the border, in this way abandoning all the refugees there. Because many projects were being stopped or dramatically reduced, the need for help in the border area kept increasing. Therefore, we decided we would stay on the border as long as the refugees can not return to their home country. It will take a few years until this can happen, as the people need to have the necessary documents and must be guaranteed safety. At the same time we noticed that people were more willing to donate for projects inside Burma, instead of for projects along the border. We needed to try even harder to make them understand that our work along the border was not yet finished. On top of this came the economic crisis in Europe and especially in Italy. It seemed that towards the end of 2012 we would have to stop or strongly reduce our activities. Thanks to the hard work of our members, board and friends, as well as Mr. Leonhard von Pretz, we managed to stop this from happening. Our 10-year anniversary also had a big impact and many people were keen to show their solidarity with us and appreciation for our work over the years. A highlight was the visit of the President of the Province of Bozen Luis Durnwalder in January 2013. The praise and appreciation we heard from Luis Durnwalder and those accompanying him, really built us up and gave us some new positive energy. All things considered, we could say that our projects continued without problems. We had to stop the ‘Fruit and Milk’ project and tried to cut costs and save wherever we could. In the meantime we could see that our partners were happy to work with us. They realized that even in these difficult times they could rely on us and we would stick to our responsibilities. We stopped the further building of our kitchen and sewing workshop, as there is no point in investing more in this, seeing the current developments taking place inside Burma. Therefore in January 2013 we had to return the money planned for this project- around 37.000 Euros- to the Region of Trentino-Südtirol. Unfortunately in 2012 we were not able to provide extra assistance, except in emergency cases, like with the fire at Umphiem Mai refugee camp or at KM44.This was painful for us, because the need for help has become even more visible since many organizations have left. Our ‘Rays of Youth’ team travelled a lot, and among others, were invited to a youth meeting in Jakarta by MTV music television. They were the only group representing Thailand there, even though they are not Thai. On the one hand we received generous support at important times, but on the other hand two school adopters were not able to continue due to their own financial problems and some important donors were forced to reduce their contributions for the same reasons. We are happy that Sabine and Axel Senftleben-Holzknecht have taken over the expenses for teacher salaries at Parami School. We are happy to welcome the new adopters Mrs. Caroline Capito and Mr. Manuel Cerruti. Thanks for the continuous support to Mr. Reinhard Plank USA, Maro Foundation, Missio - Bischöfliches Ordinariat, Südtiroler Sparkasse Foundation, Province of Bozen and Region of Trentino-Südtirol. A special thanks goes to Mr. Bufler and to the Swiss Seaside Foundation for the generous contribution for our youth center (thanks to Mr. Max Stürzer for the contact). The Austrian chocolate producer Zotter created a special Help without Frontiers chocolate (Schokolade macht Satt). For every sold bar of this chocolate, 30 cents goes to Help without Frontiers Austria for our food programme. Mr. Josef Zotter and his family also visited us in Mae Sot. In October Karin Thaler form Brixen joined our team. She has taken over responsibility for our work in Brixen. On top of accounting, Burkhard Kofler has taken on the duty of issuing donation receipts. We ended 2012 with a surprisingly positive result. We will have 695.355 Euros (+19.3%) for our projects. On top of this we will have 58.664 Euros at our disposal for our administration. We remember our colleague from the Yummy!-Team, Lin Myat Soe, who passed away last year. We would like to thank our board and all members, friends and donors for their engagement in our organization. Special thanks go to our board members Christina Kuppelwieser and Anne Dalle Mulle, who stepped down from the board due to personal reasons, but continue as active members. We would also like to thank the Tax Consultant Studio Tauber & Partners in Brixen, and here especially Burkhard Kofler, who has been taking care of our accounting since 2012. Thanks also to the Human resources Consultants Sachsalber and Girardi in Bozen, who take care of our salary accounting and human resources management for free, especially to Dr. Phillip Girardi, who has been taking care of our wage accounting for free. Also many thanks to our auditors Katrin Teutsch and Annelies Senoner. Big thanks to our long time volunteer Thomas Feichter for his continuous IT-support, also to Markus Moroder for his advice and care and the payment of one domain. Special thanks to the artists Guido Moroder, Martin Rainer, Claudio Olivotto, Gaspare Bruccoleri and Pia Pedevilla for their beautiful motifs for our Christmas cards. For their efficient, committed and valuable work we want to thank our team in Mae Sot, first of all our manager Ann Siraporn Kaewsombat, but also her closest staff Lena Weller, Chaung Khu and Jolie. Special thanks go to Lena Weller, our sunshine, who left Mae Sot after 6 years of wonderful work, to start a new job in Switzerland, which gives her enough freedom to work for us at least part-time. We would like to thank the many patrons, listed below, especially all private persons and companies who help us to cover our administration costs, but also all others who support our associations work through donating money, things, or even time and advice and help us by doing so to keep our 100% donation guarantee. We thank all project adopters. We understand that many of them are forced to cut costs in these hard times. We are happy that despite the crisis, new school adopters have made long-term commitments to support their new projects. We especially thank all the small and big donors, everybody who invited us for events or who collected donations for us during their own campaigns and events. Without this contribution and support none of this would be possible. 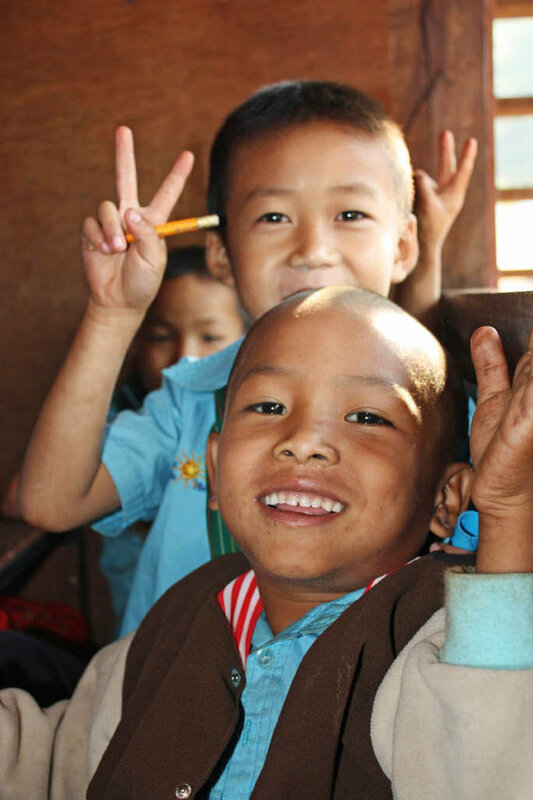 We thank all our volunteers who helped in Mae Sot or taught in our schools over the year. We thank our partners on site, the refugees, who make our work easier through their trust, honesty and outstanding personal commitment. (Brixen), Wolf Fenster (Schabs), Rag. C. Zago (Bozen), Zotter Schokolade (Bergl).